It's rare that a vegetarian dish can really satisfy us, but this one did and I think it will become a new favorite in our repertoire. 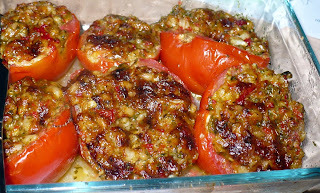 Mix everything except the tomatoes together and then fill the tomatoes with the mixture. 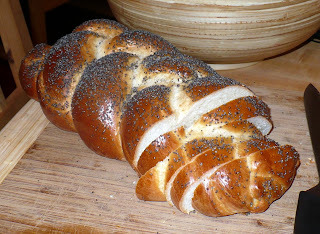 Bake on 375 for about 25 minutes, then finish under the broiler for a few minutes, until the tops are browned. 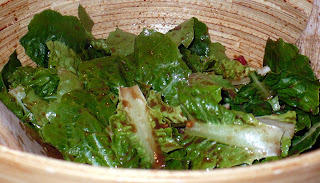 I made this vinaigrette with whole grain mustard and sweet-hot mustard. 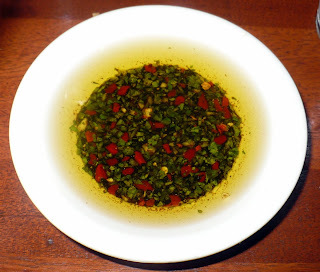 This was a simple side dish that can be served warm, cold, or room temperature. Boil the beets whole until you can insert and remove a knife point easily. Then drain and run under cold water while slipping off the skins with your hands. 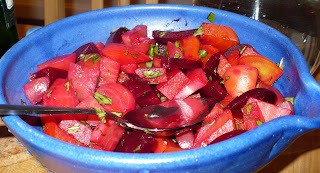 Dice the beets, then toss with the basil and orange juice and season with salt and pepper. 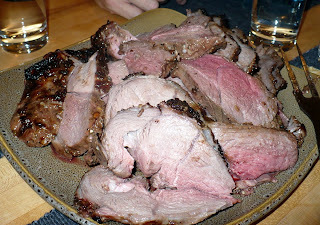 A leg of lamb is a great main that takes very little hands-on time. Marinating the lamb over night really helps it become fully infused with flavor, and then when you get home from work Friday night, you can just pop it in the oven. Combine all ingredients except lamb into a paste and then rub all over the lamb and place the lamb in a covered bowl overnight. Then roast the lamb on 375 until the internal temp reads 118. Then let the lamb rest for about 20-30 minutes, or until the internal temp reads about 135. Slice and serve. 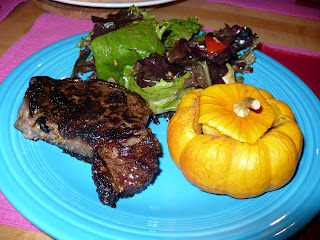 I received these little pumpkins in our CSA box and was surprised to learn that you can actually cook them. I'd always assumed they were bred for decoration and were not flavorful, but I was wrong. They are sweet and tasty and bake in no time. Cut the top off the pumpkins and scrape out the seeds. Sprinkle in some spices, put the tops back on and bake on a cookie sheet, on 375 for about 30 minutes (until a knife goes in easily). I'd never been to Paragon, and I doubt I'd go again. They seemed ill-prepared to handle a large (14 person) group. The food arrived slowly, and cold. The servers didn't seem to know where the plates were headed. Perhaps the food would have been better if it were served hot, but it was not. The oil and vinegar for the bread was very pretty--almost like a mosaic. 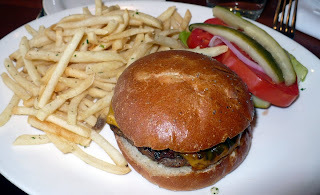 The fries and the burger were cold. The bun tasted a bit stale and was not toasted. Not good. 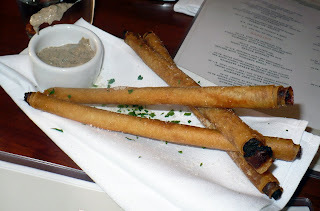 These pastry sticks filled with duxelles were ok, but were I didn't want more than one. This meal consisted of steamed bok choy, ramen from a package (yes, the Top Ramen of your youth), and rockfish slathered with rooster sauce and miso, and baked for about 15 minutes on 350, until flaky. Cento is basically a window in an alley that serves a small list of lunch specials. While this sandwich was tasty, it was very pricy for what it was. It contained very little mozzerella, and it left me hungry an hour later. However, the addition of roasted garlic was very tasty.